Malachite is a copper carbonate hydroxide mineral. This opaque, green banded mineral crystallizes in the monoclinic crystal system, and most often forms botryoidal, fibrous, or stalagmitic masses, in fractures and spaces, deep underground, where the water table and hydrothermal fluids provide the means for chemical precipitation. Individual crystals are rare but do occur as slender to acicular prisms. Pseudomorphs after more tabular or blocky azurite crystals also occur. The stone’s name derives (via Latin: molochītis, Middle French: melochite, and Middle English melochites) from Greek Μολοχίτης λίθος molochitis lithos, “mallow-green stone”, from μολόχη molōchē, variant of μαλάχη malāchē, “mallow”. The mineral was given this name due to its resemblance to the leaves of the mallow plant. Malachite was extensively mined at the Great Orme mines in Britain 3,800 years ago using stone and bone tools. Acheological evidence indicates that mining activity ended around 600 B.C.E with up to 1,760 tonnes of copper being produced from the mined Malachite. Archeological evidence indicates that the mineral has been mined and smelted to obtain copper at Timna Valley in Israel for over 3,000 years. 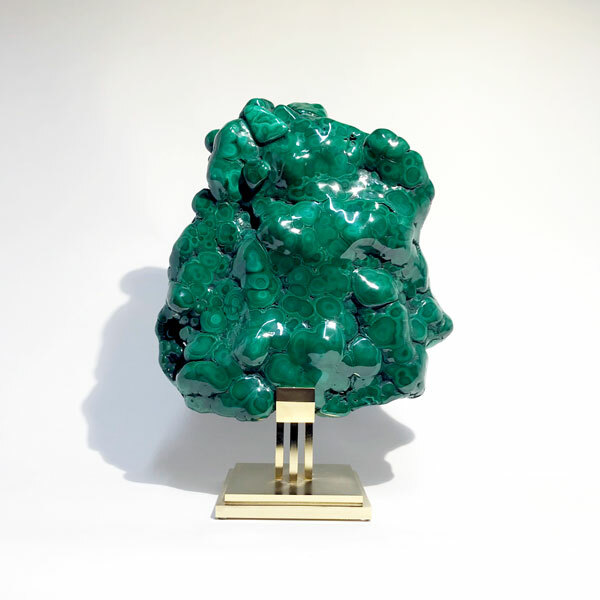 Since then, malachite has been used as both an ornamental stone and as a gemstone. In ancient Egypt the colour green (wadj) was associated with death and the power of resurrection as well as new life and fertility. They believed that the afterlife contained an eternal paradise which resembled their lives but with no pain or suffering, and referred to this place as the ‘Field of Malachite’. Malachite was used as a mineral pigment in green paints from antiquity until about 1800. The pigment is moderately lightfast, very sensitive to acids, and varying in color. This natural form of green pigment has been replaced by its synthetic form, verditer, among other synthetic greens. Malachite is also used for decorative purposes, such as in the Malachite Room in the Hermitage, which features a huge malachite vase, and the Malachite Room in Castillo de Chapultepec in Mexico City. “The Tazza”, a large malachite vase, one of the largest pieces of malachite in North America and a gift from Tsar Nicholas II, stands as the focal point in the center of the room of Linda Hall Library. Large quantities of malachite have been mined in the Urals, Russia. Ural malachite is not being mined at present,but G.N Vertushkova reports the possible discovery of new deposits of malachite in the Urals. It is found worldwide including in the Democratic Republic of the Congo; Gabon; Zambia; Tsumeb, Namibia; Mexico; Broken Hill, New South Wales; Lyon, France; Timna Valley, Israel; and the Southwestern United States, most notably in Arizona.